WhatsApp, Facebook, Domino’s Pizza, KLM Royal Dutch Airlines etc...all these large companies are now using chatbots. The new ‘buzzword as it is the new trend among companies. With such a craze, you could wonder whether bots are the future, and yes it is, or at least it’s the future of many departments in your company. In this blog we’ll explain you why your business should think about creating a chatbot. But first, what is a chatbot, exactly? Generally speaking a bot is any software that performs an automated task. When it involves chat with a user through a conversational interface, we call it a chatbot. Nowadays, we are seeing a larger shift in consumer behavior. In the era of fast information flow through the internet, consumers want the information as quickly as possible. Moreover, people are now using messaging apps like Facebook Messenger, WhatsApp, WeChat, or Viber. Today, messaging apps have over 5 billion monthly active users, and for the first time, people are using them more than social networks. By integrating bots with these apps, businesses have the possibility to deliver their messages and services in the place where customers spend most of their time and are able to react faster to customer requests. Chatbots as conversational agents, using text or voice commands to answer questions or guide visitors on your website. The bot can serve as an alternative solution to customer service representatives, but with more advantages. As they are 24/7 available, they have access to a very broad array of information instantly and gets smarter the more. Moreover, they can outperform humans in terms of the speed and accuracy in a narrow domain, this is crucial in a time when people want instant results. A chatbot is following a inbound messaging framework, which consists of 4 steps. 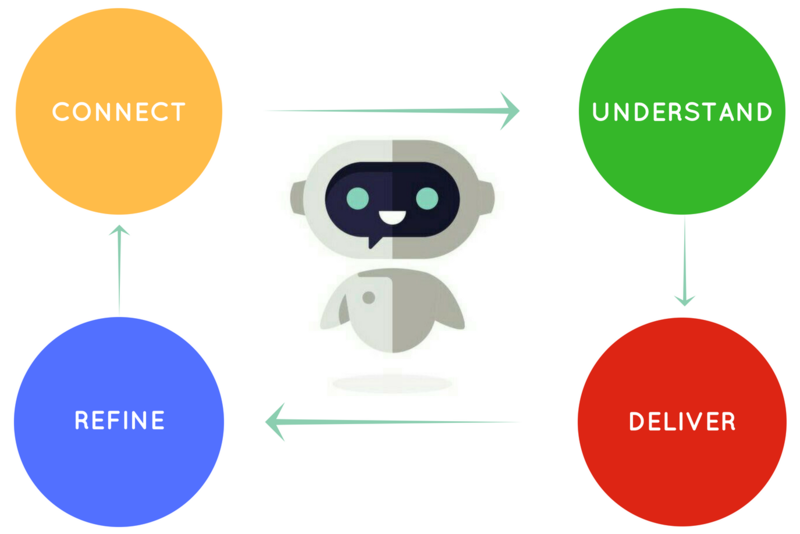 The bot is leading customers through a series of dependent questions to collect the necessary information to understand their intent, and then deliver the right content to satisfy the customers needs. Firstly, the person connects to the chatbot via an application, website or messaging app. The chatbot is then engaged in a conversational tone and use the existing contact record to add personal context. Secondly, the chatbot tries to understand the user’s intent in the most efficient way possible by designing a conversation using filtering questions. After gathering all the information necessary to understand the customers ask. The chatbot processes and continues to the third step. Thirdly, the chatbot delivers a solution and answers users without forcing them to leave the application. Lastly, based on user interactions, your company can optimize the conversational strategy to provide more value and encourage habitual use of the bot. See what a chatbot can do to help you order a pizza. Say you are sitting at home and are not in the mood to cook something today, so you get thegenius idea to order a pizza. You could simply visit the website of your favourite pizza company close to your home, scroll through the list of different pizzas they offer. Then, once you finally decided which pizza you want to have, you can either fill out multiple questions on where to deliver or call the pizza company to make the order. Now imagine the pizza company is so sophisticated that their website or app has a chatbot. Then, everything for you would be much easier and faster as you just have to tell the bot what you want. Of course this is just a simple example of what a chatbot can do. Now think about Domino’s Pizza, the American chain restaurant with more than 14,400 branches around the globe, employing over 260,000 people. The company launched Domino’s AnyWare a chatbot on Facebook Messenger. Users have to type “PIZZA” and send it to Dominos via Messenger. They can then list orders from the full menu available. Moreover, users can place their orders through Easy Order for faster order processing the next time they use the chatbot, and they can click on a link sent by Dominos to track their order. The pizza company introduced the chatbot ahead of the Super Bowl in 2017 as a PR tool and to take advantage of its 1 billion active Messenger users. Remain ahead of your competition with the latest technology! Chatbots can be a huge asset for companies internally and externally. Externally when they need to handle a large volume of requests from its customers, like in sales, marketing and support. This works well when similar responses can be sent to thousands of inquiries. Internally, you can automate, HR requests, expense applications, happiness surveys and more. Most of the larger corporations have already adopted the chatbot for improving their operations. The objective behind this latest technology is to take advantage of all channels reaching customers at their convenience. In this way, whether consumers are using Messenger, visiting your site or watching their smart TVs, your service will remain accessible. Interested in seeing the endless chatbot opportunities for your company, join our upcoming workshop: Build AI Chatbots with Google’s Dialogflow.